In our next ‘Photo of the week’ we are looking at research from BU’s Daniella Vos, an archaeology PhD student, who is looking into identifying activity areas in archaelogical sites. The aim of her research is to develop a method that will maximize the information gained from Neolithic settlements, which will allow for a better understanding of life in the Neolithic period. 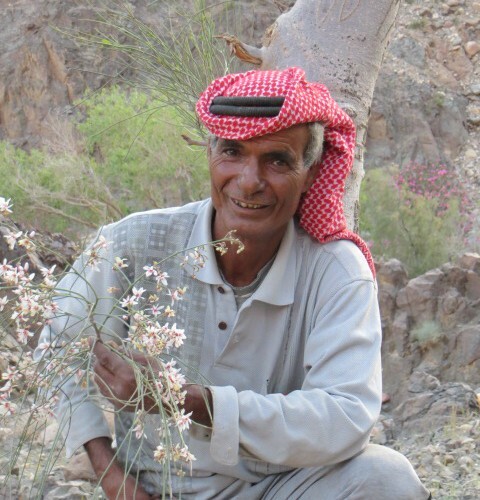 While Daniella was in Jordan collecting plant samples for a study of spatial analysis of activity areas in ephemeral or short-lived plant sites, the man in the picture was her guide to the Wadi Faynan area. His name is Jouma Aly Zanoon, member of the Azazama tribe in Jordan and a local informant for the CBRL British Institute in Amman. As well as being a trustworthy guide for Daniella during her expedition, he was also a gracious host. Jouma’s family kindly hosted the expedition members in their tent and as a visiting woman Daniella had the privilege of experiencing two different worlds. She was treated as a guest in the public male area yet able to venture off into the private/female area. 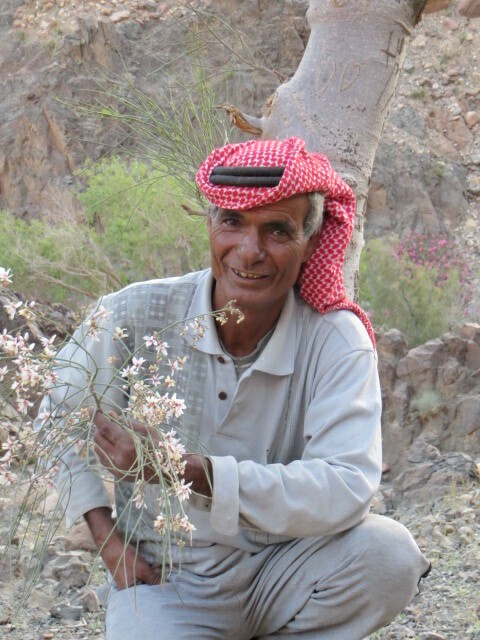 Jouma is holding one of the plants collected during the trip. Moringa peregrina was processed by the ancient Egyptians, the Romans and until recently the Bedouin, to produce a sweet seed oil. The sprig held by Jouma was brought to Bournemouth University, where it was processed together with another 80 plant species to form a phytolith reference collection. By studying phytolith distributions in Bedouin and archaeological sites, Daniella’s project aims to develop a new methodology to aid spatial analysis of activity areas in ephemeral plant sites. For more information about the project, email Daniella for further details.